On 20 September at UN Headquarters in New York, the 2018 global Multidimensional Poverty Index (global MPI) results were launched. The event was hosted by UNDP Administrator Achim Steiner. He was joined by Nobel Laureate Sir Angus Deaton, OPHI Director Sabina Alkire, Acting Vice President at the World Bank Akihiko Nishio, Assistant Secretary-General at UN DESA Elliott Harris, Executive Director of CESR Ignacio Saiz, HDRO Director Selim Jahan, and OPHI Research Officer Usha Kanagaratnam. The event was live streamed on the OPHI and UNDP HDR websites. People tuned in from around the world to follow the live stream and participate in the global discussion on Twitter surrounding the launch of the updated global MPI. In 2018, OPHI and UNDP undertook a joint revision of the global MPI, adjusting five of the global MPI’s ten indicators to better align the global MPI with the SDGs. With results covering over 100 countries, disaggregated by over 1000 sub-national regions, rural-urban areas, and age groups, the 2018 global MPI is particularly useful in identifying people who are left behind in multiple SDGs. It answers the call to better measure progress against SDG1—to end poverty in all its forms. As highlighted by Sabina Alkire during the event, the global MPI serves as a tool for policymakers to design efficient multi-sectoral, pro-poor policies. 1.3 billion people live in multidimensional poverty, meaning they suffer from overlapping deprivations in health, education, and living standards. 46% of those who are multidimensionally poor live in severe poverty, meaning they are deprived in at least half of the dimensions. 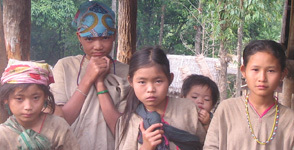 Half of the world’s poor are children. 83% of the poor live in South Asia and Africa. The vast majority of the multidimensionally poor—1.1 billion—live in rural areas, where poverty rates are four times higher than they are in urban areas. Approximately 880 million people in the world are at risk of falling into multidimensional poverty. 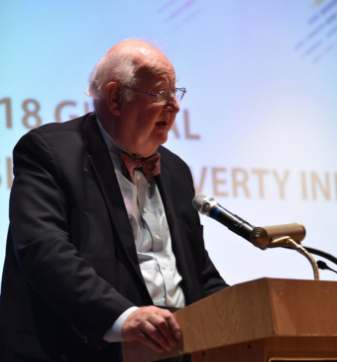 Sir Angus Deaton explained that, though there is a long way to go until multidimensional poverty is completely eradicated, there are reasons to celebrate extraordinary progress on poverty reduction. In India alone, some 271 million people have escaped multidimensional poverty in the past 10 years. Video of the global MPI 2018 launch is available here. More details on the results of the 2018 global MPI here.